Do You Have a Car Accident case in North Carolina? If you have been injured in an accident in North Carolina, you may be wondering whether you have a valid car accident case and whether you need a personal injury lawyer to represent you. This article is intended to help you figure these things out before you pick up the phone and call the first car accident lawyer you find online. Do You Have a Car Accident Case? How Do You Open a Car Accident Claim? Being involved in a car accident is one of the most traumatic and life altering experiences that many people will ever have to go through. If the accident was one where there were significant bodily injuries to you or other people you were traveling with, it just compounds the level of trauma. We’ve all witnessed a horrific crash on the highway and thought of the people involved, hoping and praying that nobody was seriously injured or killed. If you have been involved in a serious car accident, it isn’t possible to turn back the clock and undo your injuries or mental anguish for having been in that wreck. However, there is a process in place to resolve your car accident claim by paying you financial compensation. We realize that the money you may receive from an insurance company can’t undo the mental and physical anguish you have suffered, but it is available to help you start to put your life back together, pay for your medical bills and lost wages, and return your life as much as possible to the life you had before the accident. In North Carolina, there are only two ways to resolve your car accident case. The first is through a voluntary, negotiated settlement, and the second is through the court system. In both of these situations, if you injuries are significant, then using a lawyer to negotiate or file a lawsuit on your behalf can be a prudent decision. In the case of a voluntary settlement, either you or a lawyer on your behalf will work up your file, gather all relevant documents, including crash reports, medical records and bills, employment records, etc. and send those documents to the insurance adjuster with a detailed demand letter. The letter will request a certain dollar amount to settle your claim and set a deadline for the insurance company to tender payment. At this point, the insurance company can reject your offer or they can counter-offer. Depending on how the insurance company reacts to your demand, you may accept their counter-offer, continue to negotiate, or just file a lawsuit. If you file a lawsuit, then your claim will start to work its way through the courts and to trial. Although more stressful and risky, if you are successful in presenting your case to the jury then you stand to recover a higher amount of money, or it is possible you recover nothing. Either way, these are the two primary ways that a North Carolina Accident case can be resolved. In assessing every car accident claim, a lawyer will look to see whether your case could proceed successfully to trial. Because if it can’t, then the insurance company will know this and is likely to deny your claim outright and make a calculated risk that your lawyer is unlikely to file a lawsuit. In each car accident case, a lawyer is looking to see 1) whether there is clear liability for the accident, 2) whether you were injured in the accident, and 3) whether there is sufficient insurance coverage to pay for your injuries. If any one of these things is missing, then it diminishes the value of your claim and the likelihood that you will be able to recover money damages. Car accident cases in North Carolina are governed under an area of the law called Torts. Specifically, when you sue somebody who injured you in an accident you are claiming the they were “negligent”. 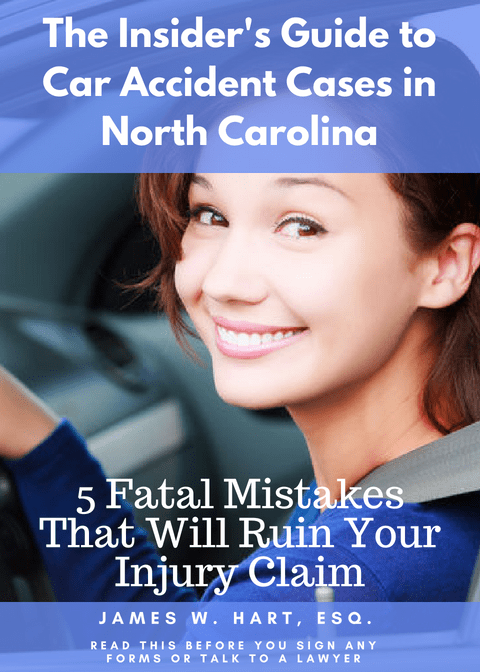 People throw this word around quite a bit, but in a legal context, you must prove 4 basic elements to prove a claim for negligence in the North Carolina Courts. Those elements are 1) Duty, 2) Breach, 3) Cause, and 4) Harm. Every law student memorizes these elements in their first year Torts class. Lets take a closer look at each of these elements as they pertain to a car accident case. There are four main elements that you must prove to win your car accident case. Those elements are 1) Duty, 2) Breach, 3) Cause and 4) Harm. The third element, causation, is the most problematic element for many cases. Regardless, here is a quick summary of each element. Every driver on the road has a duty to operate their vehicle carefully and within the legal parameters that are set for all drivers. In other words, you have a duty to follow traffic signals, follow the posted speed limits, maintain a safe vehicle, and to stay in your lane, to name a few. A drive can breach their duty to operate their vehicle safely by running a stop sign, speeding, ignoring traffic signals, recklessly swerving in and out of traffic, failing to change their tires when the tread is bare, texting while driving, etc. We all see drivers breach their duty to be safe on a daily basis. Sometimes a law enforcement officer will pull a driver over for failing to obey the law, sometimes you will just see a driver racing by you on the highway. Who hasn’t said to themselves, “that person is going to kill someone…”? You just witnessed a driver breaching their duty to drive safely. When an accident occurs, more often than not someone breached their duty to be safe. In other words, a driver runs a stop sign and hits a pedestrian, speeding causes someone to lose control of their vehicle and hit another car, a driver is texting and ignoring traffic signals so they run a red light and cause a wreck, etc. In many of these car accidents that happen everyday, nobody is injured. They are just minor fender benders. And up to now, there isn’t enough evidence from a legal standpoint to bring a lawsuit for negligence. The big X-factor in many of these cases is harm. Harm is the physical or mental anguish someone suffers after being the victim of someone else’s negligence. If you were the pedestrian who was hit by a car that ran a stop sign, then you likely suffered some sort of harm or damages. Damages can come in many forms. There are economic and non-economic damages. Economic damages include the cost of your medical care, time out of work, lost wages, damages to your car or other property, loss in earning capacity, etc. Non-economic damages include penalties to the at-fault driver for their carelessness in causing the accident. The more severe the injuries, the more likely you are to receive a higher settlement value. Sometimes, both people could have acted negligently and caused the accident. Most states will apply what is called “comparative fault” and apportion damages in accordance to the level of fault of each driver. So if you were 10% at fault and the other driver was 90% at fault, then your damages would be reduced by 10%. However, North Carolina is one of four states (the others being Maryland, Virginia, and Alabama) and the District of Columbia that apply the contributory negligence rule. This means that if you were even 1% at fault for the accident, then you will recover nothing. A bit harsh, don’t you think? You can thank the insurance lobby for this one. So if you had a hand in causing the accident, does that mean you are out of luck when it comes to making a claim against the insurance company? Here are 4 exceptions to North Carolina’s draconian contributory negligence rule. The first exception has to do with minor children, and is the so-called “Rule of 7’s”. Essentially, minor children under the age of 18 are divided into three different groupings, depending on their age. The first group of children are those under the age of 7. Children younger than 7 are legally incapable of negligence. If you have young children, as I do, then you understand why. Mentally, they are not mature enough to be aware of their surroundings and potential dangers that would cause them harm. The typical example that is used to illustrate this is when a child is playing with a ball in their front yard. The ball runs into the street, and the child chases it. Do they look around to see if a car is coming? No. They have one thing and one thing only on their mind… Get. The. Ball. If they were to be hit by a car, even though they may have been negligent, in the eyes of the law they are incapable of negligence and the doctrine of contributory negligence would not be a defense to their actions. The second group of children are those from ages 7-13. Children in this age group are presumed to be incapable of negligence, but this presumption can be rebutted by evidence showing that they did not use the care that a child of their age, capacity, discretion, knowledge, and experience would have exercised under the same circumstances. This is an issue that a jury would have to decide, if the case could not be resolved ahead of time. Minor children that are ages 14-17 are capable of being held contributorily negligent. They are presumed to have the sufficient capacity to understand the danger of certain situations and the ability to avoid that danger unless evidence can be shown that rebuts this presumption. The next exception to the doctrine of contributory negligence is known as cognitive impairment. If the plaintiff was mentally impaired, then they would be held to the same standard as a reasonable person with their same disorder. For example, an elderly person with Alzheimer’s or some other form of dementia would be compared to another person with that same disorder, and not someone without that cognitive impairment. Gross negligence is one of the most common exceptions to the doctrine of contributory negligence. Basically this is willful or wanton conduct that was the cause of the Plaintiff’s injuries. Gross negligence is a deliberate act that the at-fault party knew or should have known would have been likely to cause harm. An example of this is someone who is speeding down a residential street at 60 miles per hour and hits someone who was walking the middle of the street. The last exception to the doctrine of contributory negligence is the last clear chance rule. What this rule says is that if the guilty party had the last clear chance to avoid the accident, but didn’t, then contributory negligence is not a defense. An example of the last clear chance is if a pedestrian were jay-walking and was hit by a speeding car. Ordinarily, jay-walking is considered negligence and the pedestrian would not be able to recover. However, if the driver of the vehicle saw the jay walker and had the last clear chance to avoid a collision, but failed to do so, then the pedestrian can recover regardless of the fact that they were contributorily negligent. So you think you have a good car accident case, you believe that the other driver is at fault, your own negligence didn’t contribute to the accident, but if it did you think that one of the exceptions applies. So now what? 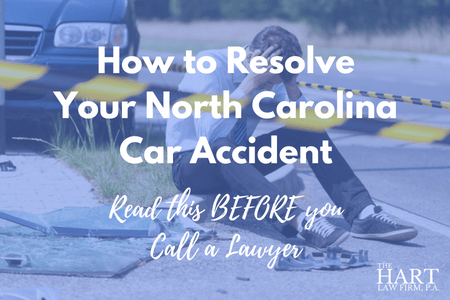 How do you open up your North Carolina Car Accident case? That part is easy. You pick up the phone and make two phone calls. The first is to your own insurance company to let them know you have been in an accident. Not only will this allow them to start investigating your claim, but they may also give you instructions on how you can collect your Med Pay benefits, as appropriate. The second call is to the at-fault party’s insurance carrier. Keep in mind, you are not required to tell them anything. If they ask for a recorded statement or specific details about the crash, you tell them that you were in an accident, that their insured hit you, and that you were injured. That’s it. Now that you have informed both insurance companies that there was an accident, you may need to talk to witnesses. Witnesses are innocent third parties who may have witnessed the crash and can explain what happened. They will be extremely helpful, especially if their version of events lines up with what you say happened. Since witnesses, generally speaking, don’t have an interest in the outcome of the accident, they tend to be pretty reliable sources of information. The last call you should make is to a lawyer’s office. Click here to figure out if you need a lawyer to help you. At The Hart Law Firm, we help people who have been injured in a car accident case. I include this option last, but it is possible that calling your lawyer may be the first thing you decide to do. If you call our law office, we will take care of all the details necessary to get your car accident case opened. The only thing you will need to focus on is getting to your doctor’s appointments and healing your body. We take care of the rest. In North Carolina, the insurance claims process involves gathering all of the documents required by the insurance company so that they can properly evaluate your claim and decide whether and how much money they will pay you for your injuries. Make no mistake about it, the insurance companies are in the business of making money. The less money they pay you, the more money they keep every year as profit. Because the minute you got into a car accident, you stepped onto a battleground against a corporate interest whose main goal is to pay you as little money as possible. Make no mistake about it, the insurance companies will lie to you, attempt to trick you, dig up dirt from your past to use against you, and attempt to minimize your pain in an effort to get you to settle your case as quickly as possible for as little as possible. Whether you know it or not, the extremely well-funded insurance lobby is working day and night to put out advertising campaigns that would smear people who have been injured in an accident and the lawyers that represent those people. They want the general public to believe that law firms like ours are nothing more than “ambulance chasers” and that victims like you are just greedy people who are seeking a “quick buck” by filing “frivolous lawsuits”. Stop reading for a minute to let that sink in. Isn’t that the way your felt before you were injured? The insurance companies are also donating money to fund the campaigns of state and federal lawmakers who are actively working to change the laws surrounding what injured people can and cannot sue for. Make no mistake about it, every year it gets harder and harder for everyday, hardworking Americans to pursue their day in court in the event they are injured. And that is exactly what the insurance companies want. But that’s why we do what we do. We believe that wrongfully injured people like you need a voice. If you just give in to the pressure that the insurance company puts on you, then they win. But you don’t have to lay down. This is a fight you can win, and we can help. Nobody said the insurance claims process is easy. Nobody said that the insurance company will just cave and write you a fat check. Nobody said that you can avoid going to court if you don’t want to file a lawsuit. As lawyers, we can’t make any guarantees about the outcome of your case. But we can guarantee that if you give up the insurance company will win. We are here to make sure you don’t do that. If you have questions about the accident claims process in North Carolina, please feel free to call us at (919) 883-4861 and we would be happy to take your hand and walk you through the process. The first step of the insurance claims process is to gather all the information that the insurance adjuster will need to properly evaluate your claim. This doesn’t typically happen until after you have finished all of your treatment with your doctors, and that can take anywhere from three to six months. Click here to learn more about Med Pay and how it can help you pay your doctor’s bills. Once you have finished treating, we will order a copy of all of your medical records from all of the doctors you have treated with. If you have any pre-existing conditions, we would order records from those doctors as well. We will also order a copy of all of your itemized bills and records showing what payments were made and who made those payments. While we are waiting for you to finish treating, we will order a copy of the police report for your crash and begin tracking down witnesses and getting their statements. Liability experts that can prove that the other person caused the accident. These may include engineers, accident reconstructionists, etc. Damages experts that can testify as to the extent of your present and future damages. These experts can testify as to what your injuries are, how they will affect your earning capacity, and what your future cost of medical care might be. Once we have gathered all of these documents and records, spoken with witnesses, and (if necessary) talked to possible experts about your case, we will prepare a written settlement evaluation for you that outlines possible resolutions and potential risks. We will discuss this evaluation with you so that we can make sure that everyone is on the same page when it comes to the settlement negotiations we are about to undertake on your behalf. Once you have agreed to our analysis of your case, we will prepare an initial demand letter and related documentation to send to the insurance adjuster. We will typically give the insurance company 30 days to respond to our settlement demand. This will begin the “negotiation” phase of your case. At this point we will be negotiating with the adjuster to reach the best possible outcome for you. Our goal in this process is to exceed the dollar amount you have authorized us to settle the case for. If we are unable to reach a resolution with the insurance company for an amount that is satisfactory to you, then we will move on to the next phase of the process, filing a lawsuit. At this point, filing a lawsuit is merely a formality. We have already researched your case in-depth, we know the strengths and weaknesses of your case, and can anticipate possible defenses that the insurance company will raise. However, that doesn’t mean that litigation is easy. But being fully prepared when litigation begins makes it “easier”. Once a lawsuit is filed, we must serve the defendant and potentially your own insurance company (if you are making a claim for uninsured or underinsured motorist coverage). Once they have been served, they will have thirty days to file a response, which will typically include a motion to dismiss. After we get through those initial hurdles, the case will enter the “discovery” phase. The insurance company will send you written questions to answer under oath and you may be asked to give a deposition. We will submit similar requests to the at-fault party. Somewhere along this process we will mediate the case, which is a process whereby a third-party mediator will work with us and the defendant’s to attempt to settle the case. If we are unable to settle the case at mediation, a trial date will be set. A car accident trial can take anywhere from several days to several weeks, depending on nature and extent of the injuries and the number of expert witnesses involved. At the end of the trial, the jury will render a verdict and award damages. Unless one of the parties appeals the verdict, this will formally end your case. The final step is that a payment will be issued by the insurance company and funds will be released to pay off experts (as attorneys, we will typically advance these costs), medical liens, and attorney’s fees. The remainder of the funds will be sent to you as the accident victim.